Here is a fabulous custom double entry gate with FACTORY-DIRECT PRICING. Regularly $3500, we offer this beautiful Custom Dual Entry Gate at a great factory-direct price for only $1899. 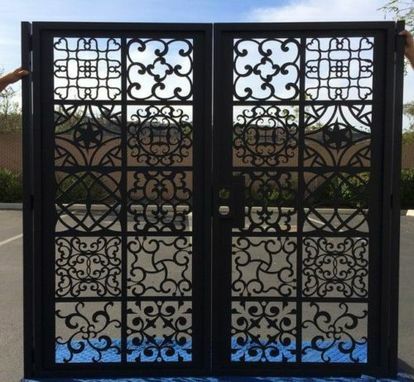 This dual entry gate is a beautiful design with lovely flow. Designed in Italy and fabricated at our facility in California, this is a perfect gate for an entry way to a home or garden. 1. Rough opening: 6'. Rough opening holds the dual gate, posts and hinges installed. Height: 6'. The design in the listing photo to be fabricated in this size. 4. Fabricated with 1 or 2 standard holes for lever and bolt lock. Customer supplies lever and bolt lock. Customer decides active gate and gate swing. Passive gate can be opened as needed. Passive gate includes standard drop pin. Gate does not include the additional third bar across the top as shown on the listing photo. 5. Includes sandblasting, baked on zinc primer and standard powder coating. Several standard colors available at no additional charge. This is a dark black powder coating. Medium gloss. Delicate hammered finish. $250 value free. Beautiful color. Makes the gate stand out. This is a dark black powder coating. Semi-gloss. Delicate sand finish. $250 value free. More subtle color. Following are Custom Powder Coating Colors available for a $79 upgrade. Custom Textured Oil Rubbed Bronze. Exceptionally beautiful color. Custom Copper Vein. Exceptionally beautiful color. Contact us for a shipping quote. We do not charge for packaging and handling. Each item is custom fabricated per order. Please allow 15 business days to ship the gate. 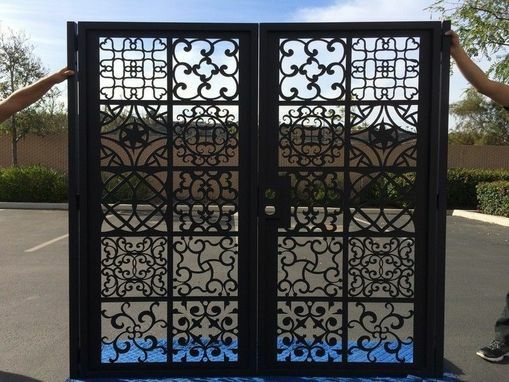 You cannot find a beautiful gate like this at your local hardware store!